CIO Advisor APAC is a print magazine providing knowledge network for tech professionals across the Asia-Pacific region (APAC). CIO Advisor’s mission is to enable the CIOs of mid- to large-sized enterprises in APAC countries to leverage technology for their business. Published in Silicon Valley, USA, the magazine has an editorial presence in all major APAC countries and subscribers all over APAC. “While manual processes are time-consuming, inefficient and add unnecessary costs, digital adoption is currently lagging, especially in ocean freight,” Felix Richter points out. “We’re helping beneficial cargo owners – BCOs – and freight forwarders to digitize their workflow processes and then plan and monitor their freight operations more effectively.” The added value Ocean Insights offers enables BCOs or logistic providers to gain a decisive competitive advantage. At the same time, Ocean Insights is working with its existing data to develop intelligent solutions that enable customers to gain added value from shipping trends and statistics. Felix Richter is convinced that market intelligence has huge potential in enabling smart decisions for operational cost savings, supply chain optimization and network design. 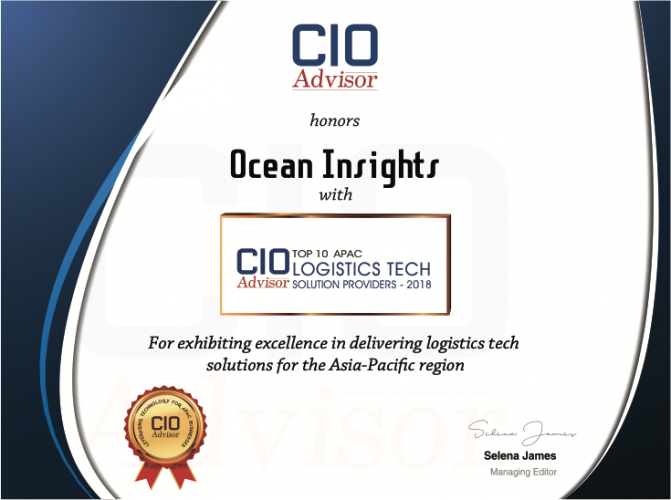 The CIO Advisor award honours Ocean Insights’ performance in the provision of logistics tech solutions.